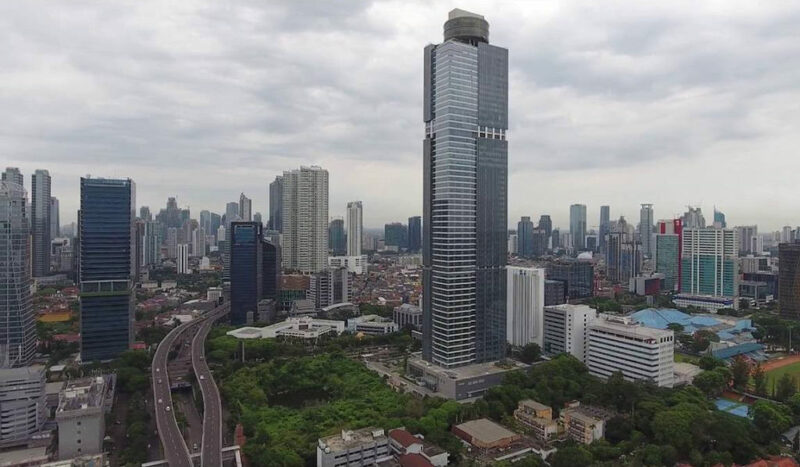 While the forests of Indonesia’s outer islands continues to diminish year by year, the concrete ‘forest’ of skyscrapers around Jakarta’s Central Business District continues to sprout relentlessly. These two trends are not unconnected – much of the capital needed to build the urban architectural marvels came from the exploitation of natural resources, and the indigenous communities which live on the lands where they are found. In 2016, Jakarta’s newest tallest skyscraper, the Gama Tower, opened for business for the first time. At 69 stories and 285 metres high, it is intended for offices and a luxury hotel. 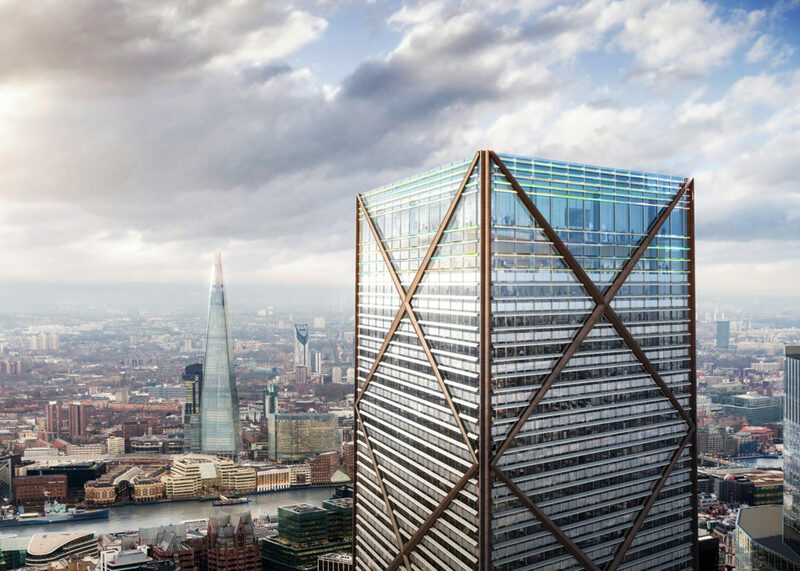 It’s a project of the Gama Corporation, who also have in their portfolio of planned developments the second tallest building in Western Europe, 1 Undershaft in London. Gama is an abbreviation of the names of two brothers, Ganda and Martua Sitorus, who have both built their fortune on palm oil. Martua is one of the founders of Wilmar, South East Asia’s largest agribusiness corporation. Ganda’s career has been more low profile, but he has also developed a portfolio of plantation assets, in a group formerly referred to as Ganda Group or Agro Mandiri Semesta Plantation. Now the AMS Ganda Group appears to have been rebranded as Gama Plantation. Recent job adverts have described the group as having plantations in Jambi, Riau, Aceh, Kalimantan Barat, Kalimantan Timur, Sulawesi Barat and Papua Provinces. Their plantations still being young, neither of these two Papuan companies has yet built a mill to process their fruit, and so is not trading in palm oil. However Wilmar, of which Martua Sitorus is still a director and shareholder, continues to buy crude palm oil from other Gama Plantation companies. 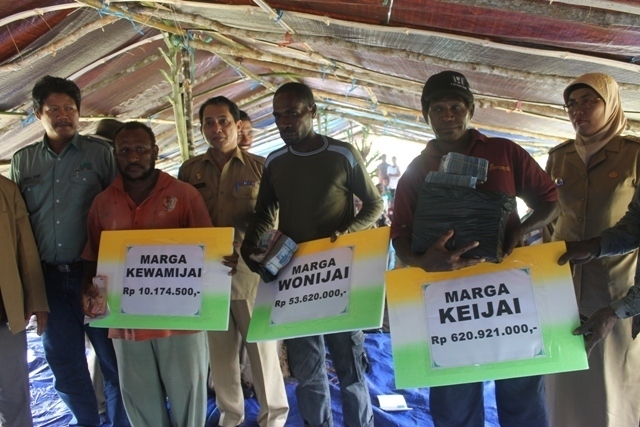 Since the two Papuan concessions are continuing to clear forest, and have opened a series of conflicts with local indigenous communities through unacceptable land acquisition practices, this is therefore in violation of Wilmar’s own ‘no deforestation, peat or exploitation’ policy. Clearance work is ongoing in the two plantations. In 2017 most of the deforestation took place in PT Agrinusa Persada Mulia, which had cleared an estimated 2000 hectares of forest between December 2016 and late August 2017. 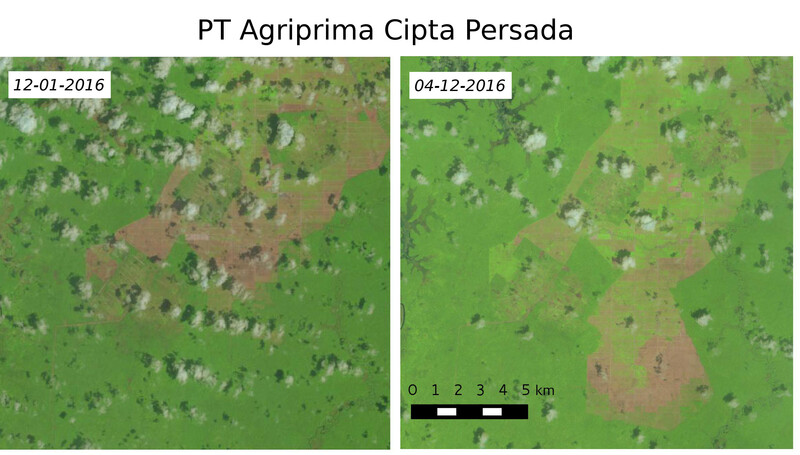 PT Agriprima Cipta Persada has not increased its deforested area significantly in 2017, but in 2016 at least 2500 hectares was cleared and there are no signs that the company has committed to stop land clearing. In 2015, after the company had started clearing the disputed land, the clan met and decided to prohibit the company from accessing the land. 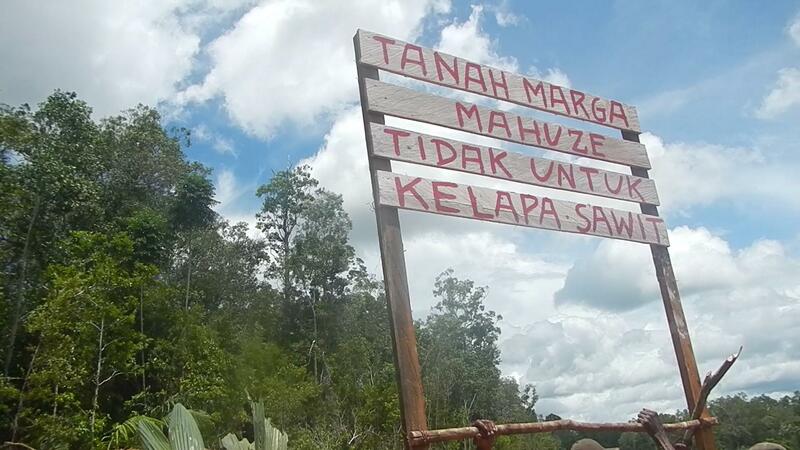 They erected wooden signs around the boundaries of their land which stated “The Mahuze’s land is not for oil palm”. These signs were uprooted by the company on several occasions, including 5th February, 22nd June and 30th June, and the company continued to work.5. In another example of intimidation by state security forces, one day after another action on 10th October 2015, police called the clan chief and secretary in for questioning about a fire which had spread over 50 hectares,7 even though the main suspect was the company itself – palm oil companies often illegally burn newly-deforested land to speed up land-clearing. The intimidation was taken a step further on 16th June 2016, when the company gave the Kartika Setya Jaya co-operative, which is owned by the military, the contract for land clearing in the area. The Mahuze clan became aware of this when members of the military came to the house of clan leader Agus Mahuze asking him to attend a meeting with the company. Unsurprisingly, Agus Mahuze felt threatened by this action. Despite the repeated intimidation, the Mahuzes have held firm to their opposition to land clearing and at the time of writing no further clearing has taken place on their clan lands. However, the situation remains tense as company has not relinquished its claim to the land nor addressed the issue of the land already cleared. Land conflicts in PT Agrinusa Persada Mulia. The main ethnic group in PT Agrinusa Persada Mulia’s area are the Yei people. Here conflicts are less pronounced than in PT Agriprima Cipta Persada’s concession, but the evidence is that this company has also not engaged in a process of free, prior informed consent. According to Pasifikus Anggojai, although the military appear to support the company, he is not aware of any overt acts of intimidation. A factor that will likely help to mitigate future conflict is the participative mapping of all the Yei people’s lands has taken place and the results were formally signed in October last year. However, this was on the initiative of the the community themselves, supported by NGOs – the company itself was already operating before the mapping started. In Bupul, Pasifikus Anggojai says that the clans that sold their land now regret their choice, after sharing out the money and seeing it was not so much after all, and then realising that the company did not keep its promises to build community infrastructure. There have also been reports of potential land disputes in lands belonging to the Marind people in Kaiza village. River pollution has been reported in the Maro River, which flows through PT Agrinusa Persada Mulia’s concession and the Bian River, where the run-off from PT Agriprima Cipta Persada’s plantation flows. Many of these concessions are also subject to ongoing land disputes and human rights violations, similar to those in Papua. The most notorious case is PT Asiatic Persada, now renamed PT Berkat Sawit Utama. PT Asiatic Persada was a Wilmar concession between 2006 and 2013, but following a prolonged conflict between the company and the Suku Anak Dalam indigenous group, Wilmar was asked to engage in mediation by one of its financiers, the IFC. However, after three years of mediation, Wilmar suddenly sold the concession to PT Agro Mandiri Semesta and an offshore company believed to be linked to the same group. Six months later, the new owner violently evicted the indigenous inhabitants from the land. Worse was to come few months after that when seven indigenous men were brutally beaten by members of the military, one of whom died from his injuries. Wilmar, which as well as being a major plantation owner is also Asia’s largest agribusiness company, introduced a “No Deforestation, No Peat and No Exploitation (NDPE) Policy” in December 2013. In theory this means it will not buy from companies which deforest or exploit indigenous people, including not applying the principle of free, prior, informed consent. Although the NDPE policies of Wilmar and other palm oil processors and traders are having a demonstrably positive effect towards reducing palm-oil-related deforestation, the companies do seem to have several severe blind spots, where they fail to act on quite obvious violations of their own policies. One of these is Gama Plantation. On its latest published supplier lists (April 2016-March 2017), Wilmar reveals it buys from six plantation companies believed to be controlled by Gama Plantation (PT Jatim Jaya Perkasa, PT Patiware, PT Wawasan Kebun Nusantara, PT Citra Riau Sarana, PT Tritunggal Sentra Buana11 and PT TH Indo Plantation) as well as the two Gama / Samsung joint ventures (PT Inecda and PT Gandaerah Hendana). No deforestation, peat and exploitation (NDPE) policies are usually applied at the group level – if one subsidiary is deforesting or exploiting human rights then all other group companies would be subject to sanctions. However, Wilmar has already stated in a letter to Netherlands-based business and human rights group SOMO that it would not buy from PT Asiatic Persada,12 so why does it continue to buy from these other companies? Despite the fact that many of its concessions appear to be registered offshore, there is no evidence that Gama Plantation has tried to actively conceal its plantation assets. Wilmar in particular can hardly claim to be unaware of the actual structure of the Gama group, given that Wilmar founder Martua Sitorus, who is still a non-executive director of the company, is also in a leadership position in the Gama Corporation – he is the ‘mar’ in ‘Wilmar’ and the ‘ma’ in ‘Gama’. PT Asiatic Persada is not the only company that has passed from Wilmar’s hands to Gama. In December 2014, Wilmar sold PT Citra Riau Sarana to another offshore company believed to be linked to Gama, and in March 2016, former Wilmar subsidiary PT Tritunggal Sentra Buana, also passed into the hands of the Gama Group – at least according to its employees’ linkedin profiles.15 There is an ongoing land dispute within the concession. Both PT Citra Riau Sarana and PT Tritunggal Sentra Buana still sell palm oil to Wilmar. This history of passing concessions between one group and the other, coupled with the fact that Wilmar appears to still be a main buyer of Gama Plantation’s palm oil means points to a significant relationship between the two companies. Wilmar therefore undoubtedly has the potential to call for a halt to deforestation and the resolution of land disputes in PT Agriprima Cipta Persada and PT Agrinusa Persada Mulia’s concessions (including a specific commitment to respect the decisions of clans which do not want to sell). Such a move would be welcomed by local indigenous communities. The drive to take deforestation and exploitation out of the palm oil supply chain will only have a major transformative effect if certain loopholes are closed. One of these loopholes comes from shadow corporate groups – companies such as Gama Plantation which are not legal entities with a clear ownership structure, but instead obscure their ownership, in this case through offshore companies.16 Gama Plantation Group companies are responsible for land conflicts, fires, cultivation on peat, labour disputes and deforestation around Indonesia – it’s time to stop doing business with them. This entry was posted in Merauke News and tagged 1 Undershaft, Agro Mandiri Semesta, AMS Ganda Group, Gama Corporation, Gama Plantation, Gama Tower, PT Agrinusa Persada Mulia, PT Agriprima Cipta Persada, PT Asiatic Persada, PT Citra Riau Sarana, PT Graha Agro Nusantara, PT Inecda, PT Jatimjaya Perkasa, PT Patiware, PT TH Indo Plantations, PT Tritunggal Sentra Buana, PT Wawasan Kebun Nusantara, Wilmar. Bookmark the permalink. Comments are closed, but you can leave a trackback: Trackback URL.